This was one of FOOD’s daily specials, which are often things that look good and also a bit more interesting than the standard menu. 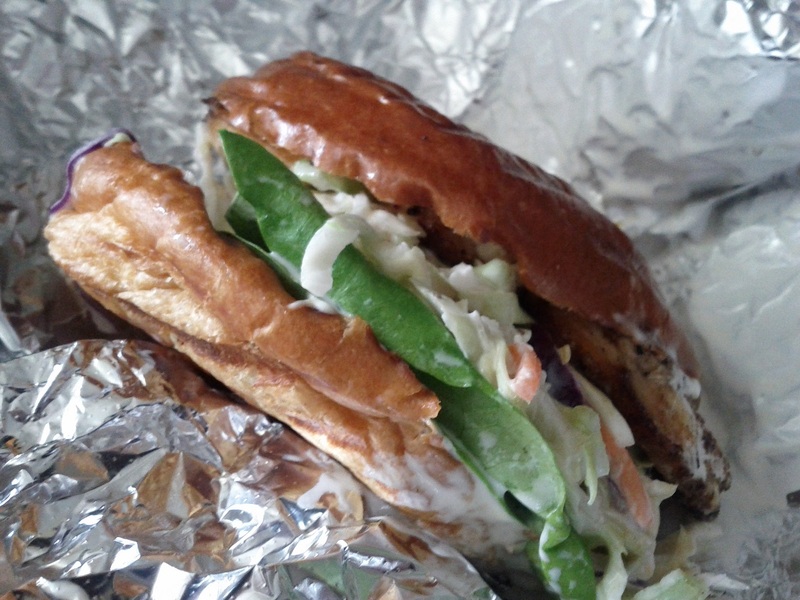 There’s nothing fancy here, just swordfish, coleslaw with something like a tartar sauce on a brioche bun. Still, swordfish isn’t an item seen on too many sandwiches. It’s expensive, temperamental in the cooking, and not wildly popular. So kudos to FOOD for going with it, and for producing a fine sandwich to boot. On the technical side, the brioche is key here. It’s been featured on a number of sandwiches discussed here, and it has a key aspect: it’s soft. Far too many sandwiches end up sliding all over the place, and a soft roll means that your bite has time to harness everything before it’s too late. So FOOD succeeds in both concept and execution, something not everyone can boast, and I’m all the more grateful for it.